It doesn't get any better than the Northeastern Navy Showband. That's my firm, objective opinion, uncolored by the fact that during the early 1980s I served as the showband's pianist, arranger and, eventually, leader. Watching this clip makes be proud that, through the Navy Musicians Association, I still am connected to Navy music, its members and mission. 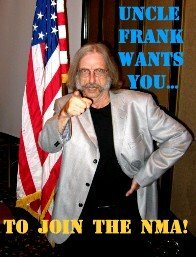 Other NMA members who led this band before my stint include Mike Beegle, Ed Rodgers, Terry Chesson, Mike Mitchell and Tex Waldron. I looked up to, learned from and tried to emulate each of these leaders. When I was done, I hoped I left the next man a better band. Clearly, that's still how it works. "I was only in the Navy for a few years; I wouldn't know anybody." This is not likely. The Navy music community has always been small. Our shipmates were not only the MUs we were stationed with, but those we knew by reputation. At my first reunion, I played with Kenny Malone, Rabbit Simmons and John Fluck. When I was on active duty, these guys were distant legends; now they're my shipmates. In fact, many of the friends I look forward to seeing at reunions are former MUs I never met before I joined the NMA. "I haven't touched my horn in years." I hadn't played a gig in 10 years when I sat in with the combo at my first reunion in 2006. True, they didn't award me a Grammy. On the other hand, they didn't throw me off the bandstand. Playing with the concert band, big band or combo at NMA reunions is entirely optional. If you join in, you're guaranteed a rewarding experience, and if you decide to sit it out, you'll have all the more time to shoot the breeze with your buddies. But don't be surprised if, the day after you get back home, you take your old axe out of the closet and oil the valves. "The years have not been good to me: I look like hell." This is not a body-builders' convention. Visit the NMA website and take a peek at the photos of recent reunions. You'll fit right in. 1] I never made chief. 2] I was passed over for LCDR. 3] I flunked out of the advanced course. 4] I suffered some other unspeakable indignity. Let me tell you from the experience of attending three reunions: nobody gives a damn. I qualify to tell many of the above sob stories. NMA President Terry Chesson tried for years to get me to a reunion. During that time I missed out on a lot of good fellowship because of my concerns about . . . well, who cares? Verdict: The court finds all pleas to be without merit. Defendants are hereby remanded to the website of the Navy Musicians Association, where they will find information on joining the NMA and registering for the June, 2009 reunion in Virginia Beach. The court now adjourns so he may dust off his fake book and try to relearn the changes to "Laura"; the reunion is only four weeks away. "Remember what Memorial Day is, what it is not." I can't find my shoe polish. Once I shined my shoes every day, not from vanity, but out of fear of punishment. Now, I do it once a year. I want to look good on Memorial Day. I'll even put on a tie and the cap of my veteran's organization. I don't wear these things to attract attention. Rather, I wear them to remind myself who I am. Although I've been a civilian for over two decades, I'm still a Navy man. Before I head out for the public ceremonies, I'll raise the flag in the front yard. It's faded in spots, and a family of moths once made a picnic of the field of 48 stars. Like me, it's an out-of-shape relic, but I hope you"ll forgive me for displaying it; in 1945, this flag draped over my grandfather's coffin. Frank Aloysius Mullen joined the Navy during World War I. He served a full career, retired and was called back to service for World War II. During that war, my father, Frank William Mullen, flew Hellcats from aircraft carriers. I was not a warrior. I enlisted so late in the Vietnam War that, by the time the Navy doctor said, "Turn your head and cough," the troops were heading home. I'm the third Frank Mullen to wear Navy blue. My pride in this tradition of naval service, however, is not the reason I fly the family flag each Memorial Day. This flag flies in memory of those who died while serving their country during war. We often confuse Memorial Day with Veterans Day, Armed Forces Day and the many other occasions upon which we honor past and present veterans. This special day of remembrance sometimes resembles a Star-studded Tribute to the Troops. Memorial Day is expressly a day to pause, reflect and remember those who gave their lives during war. In our desire to honor these dead, we should remember the things Memorial Day is not. It is not a day to exalt war. Twenty years after my father's death, sorting through a box of letters he and my mother exchanged during World War II, I learned, for the first time, that he took part in the fierce battle at Iwo Jima. While I'm as proud of my father as any son could be, I will not insult the gravity of his experience -- like too many, he woke up from his nightmares screaming for years after he came home -- by glorifying war. Ask a combat vet who's willing to talk about it: war is not a John Wayne movie. War is hell. Just as Memorial Day is not a pro-war rally, neither is it a day of protest. Those who oppose war on principle must remember that many of the wars our country has endured were unavoidable events, thrust upon us by unappeasable forces. Some were not. Nevertheless, though we may sometimes decry the motives of those who led us into conflict, we honor those who gave their all. Memorial Day is, above all, not the day to honor living veterans. We have our day in November. So, I'll be the guy in the cracked, yellowing chief petty officer's shoes on the courthouse lawn on Memorial Day. You need not thank me for my service. While I appreciate your gratitude, I'm attending the ceremony for the same reason as everyone else: to pause, reflect and remember the real heroes. Still, I'll want to look sharp. I wonder where that shoe polish is. I haven't seen it since last May. You may have seen this short film when it whizzed around the web last year. It's worth 11 minutes out of your Memorial Day weekend. I'm hearing from shipmates who are coming to the Navy Musicians Association reunion in Virginia Beach and, sadly, a few who can't make it. Frank Kemp, trombonist and friend from my first band, Navy Band San Francisco, won't be able to come. "Too many trombones in the fire," he writes. Sorry you'll have to miss the fun, Frank, but may I point out: there's no such thing as too many trombones in the fire. I haven't started packing yet, but I'm planning my trip to to Virginia Beach for the Navy Musicians Association reunion at the end of June. Copyright 1944 by Morley Music Co., Inc. Copyright renewed 1971. All Rights Reserved. Navy Musicians Association reunions are like being back in the Navy, only better: you actually look forward to rehearsals, nobody tells you to get a haircut and somebody else cleans the urinals.